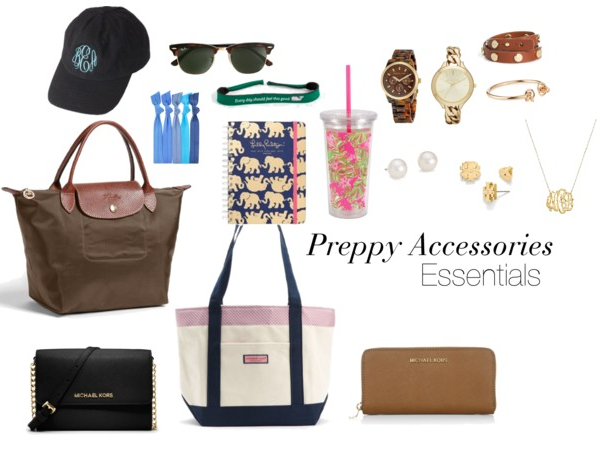 The day I started this blog, I was inspired by one singular thing – a running list in my head of all of the preppy “essentials” I was yearning for in my first year of college. Going to a school like Miami of Ohio, I was no stranger to preppy clothing and the most lust-worthy wardrobe items that preppy college students were donning. I was constantly checking sales and creating my largest Christmas list ever in the hopes that I could pick up some of these adorable items for myself! Naturally, as it was the inspiration for the entire blog, one of my first posts ever was a collage of what I believed belonged on this list – and for the last three years this post has gone a bit…viral. (Very exciting, and a little surprising to me!) But the more I explored, the more I realized that there was no true place to look up all of these items in one spot. Everything is categorized, from outerwear, to shoes, to jewelry & accessories…I’ve tried to cover all of the bases here! 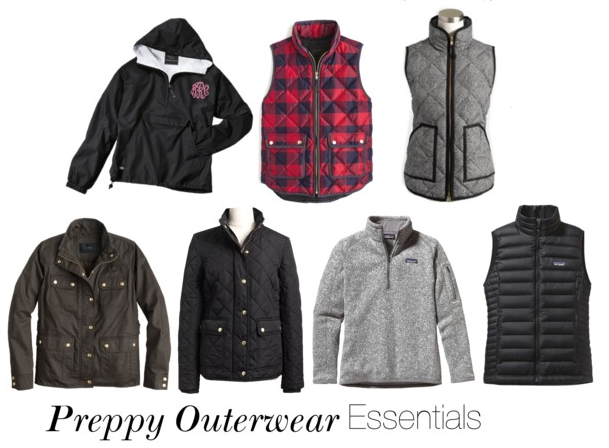 Obviously, I have a bit of a vest addiction…(you should see my J.Crew Vest Collection in my closet!) but I just think they’re perfect for so many types of weather. I always got hot walking to and from class – so vests were the perfect solution in chillier weather without being totally sweaty by the time I got there. My absolute favorite and go-to piece is definitely my Patagonia 1/4 Zip – it’s slim enough to layer under bigger jackets, and matches pretty much everything! I definitely got a little bit lazier with dressing up for class as I got older…but it was just so easy to throw on a preppy t-shirt and leggings and head to class! (More of my favorite preppy t-shirts are here and here and here) I really miss leggings 24/7 now that I’ve graduated, but my black jeans and blue skinny jeans are classic go-tos. These happen to be the specific shoes that I owned/lived in/still swear by throughout college and now – but everyone has different style, especially when it comes to boots! Storage space is limited, but a great pair of black boots, brown boots, & rain boots are really all you need to cover all the bases. My flats were typically saved for dressier occasions (not for class), but my sandals really covered the most ground across the quads. 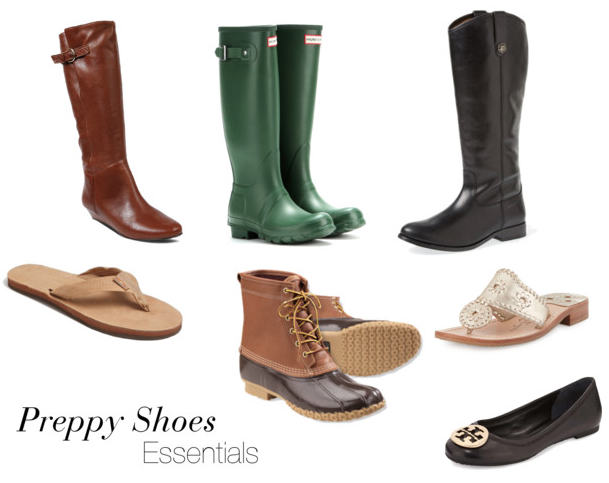 If you’re stuck deciding between Hunter Boots & Bean Boots, definitely read this first! I could make 25 posts just about accessories and still not run out of my favorites, but after a lot (I mean…a LOT) of paring it down, I landed on these few meager essentials. Jewelry was definitely the real killer for me – I collect necklaces. It’s a bit of a disease. My Longchamp tote was my go-to tote for class every single day, and I used my Vineyard Vines tote for things like heading to the gym. Cross-body bags are perfect for going out on the weekends and staying hands-free, but you don’t need tons of them! Just a classic black and a classic brown will do. Bad hair days definitely called for my monogram hat and sunglasses, and you can never go wrong with a great pair of stud earrings that go with everything. As I said in the original post, and this is the most important – THIS IS NOT A MUST-HAVE LIST!!! You will NOT stick out, or feel out of place if you don’t have every single item (or even some of the items) on this list! 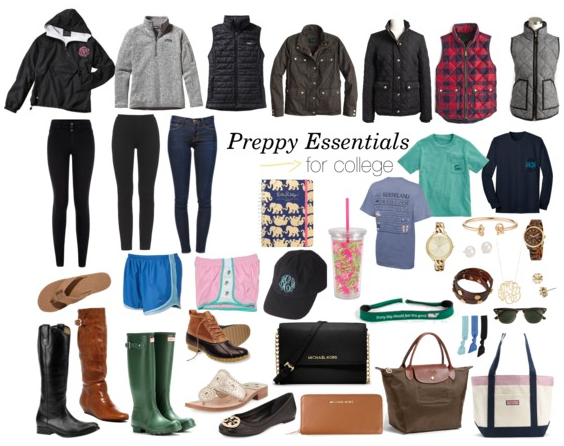 This is simply a guide for any girls, preppy or otherwise, that want some help determining what they might want to shop for before they pack their bags and head off to some of the best years of their lives! I hope this list is helpful, and as always feel free to reach out with any advice or questions about college, fashion, or just to say hi!